Swanton Consulting is a specialist engineering company that provides unique skills for the alteration, demolition and construction of complex building structures. Comprising a team of experienced engineers and technicians, Swanton looks to create practical and cost effective solutions for their clients, specializing in the design of temporary works that facilitate deep basement construction, façade retention, specialist structural elements and contractor delegated design elements. Swanton is optimizing its workflow using point cloud processing software from Pointfuse in order to reduce the time taken to create usable 3D models from weeks to just a few hours. 4-6 Stanhope Gate, London, is a new development of prestigious serviced apartments located adjacent to Hyde Park and Park Lane. The first stage of development was to demolish two existing properties on the site. Due to the Listed status of the existing façade, all demolition, excavation and construction relating to the new development, needed to be completed while keeping the façade intact. The retained façade, comprising two separate structures, required support in the temporary condition. This would allow for excavation three storeys below the existing basement level and extension of the basement footprint to approximately 5 meters out under the street. Throughout this phase of the development, the façade would be effectively left in a floating state. The Swanton team needed to develop a solution positioning horizontal and vertical steel structures around the façade’s stone features, porticos and permanent piles and columns. The layout of this scheme was heavily driven by 3D modelling and point cloud surveys. The façade steelwork had to be designed to allow installation in a tight central London site where the use of cranes was restricted and the neighbours, including the adjacent hotel, played a large part in logistics and planning. 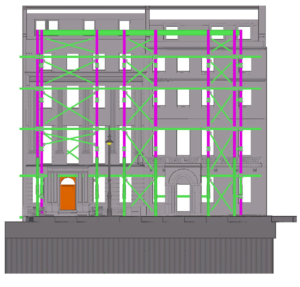 With differential settlement also a risk, the façade support was developed with consideration to jacking points which could, if required, be used to control and counter any settlement of the façade. A point cloud survey was carried out by Swanton’s in-house specialist services division, Swantest. Using a Leica ScanStation laser scanner, the scans were registered and cropped in Cyclone. The resultant point cloud comprised more than six million points. To design their development, Swanton utilise a 3D construction modelling software platform from Trimble, Tekla Structures. Conventionally, a point cloud survey would be imported into Tekla Structures using its point import tool. Once imported, each data point in the point cloud would be saved as a cross hair point. In the case of the point cloud of this façade, the resultant DXF CAD files totalled 1.5Gb in size, and took almost two weeks to manually digitize into a usable model onto which the steel structure framework could be designed and positioned. Realising the impact on the project lifecycle of prolonged data processing, Swanton undertook a review of alternative solutions and identified Pointfuse as providing a way of improving the processing workflow efficiency. Swanton needed to convert the point cloud of the façade into 3D model, before importing into Tekla Structures to undertake the engineering design of the steel supports. Converting the point cloud into a 3D model for this purpose was an automatic process using Pointfuse. The resultant model was exported from Pointfuse in the open IFC format for onward use in a variety of software packages used on the project, including Tekla Structures and AutoCAD Revit. Specifically, the Swanton team were able to perform operations such as clash detection to the steel supports, directly within the Tekla Structures design environment, without needing to be concerned about digitizing the point cloud first. In addition, rather than taking nearly two weeks to create usable models, the Pointfuse output was ready for use by the steel work designers in less than a day. Pointfuse is a powerful modeling engine that delivers a fast, precise and flexible way of converting the vast point cloud datasets generated by laser scanners or photogrammetry into high fidelity mesh models. Designed for anyone capturing or using point cloud data, Pointfuse uses advanced statistical techniques to create mesh models which can then be manipulated using any industry-standard CAD system. Pointfuse represents a new paradigm in the processing of laser scanned point cloud data. Now with a simple ‘one touch one button’ approach, the new techniques in Pointfuse not only convert point clouds into 3D mesh models with accurate geometry but also enable discrete surfaces in these models to be isolated and manipulated in third party software to a greater extent than ever before.